"The watchword of his life was duty." 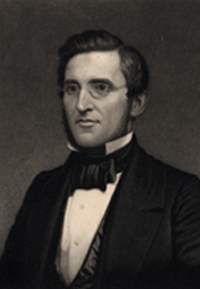 When he graduated from Wesleyan in 1840, Joseph Cummings probably never dreamed that one day he would be called back to his alma mater as its fifth president, the first alumnus to hold that honor. Cummings was born on March 3, 1817, in Falmouth County, Maine. The son of a minister, he joined the faculty of Amenia Seminary in New York State as a teacher of mathematics and natural science. Three years later he was elected principal of the school, but three years after that he resigned in order to become a Methodist minister. After seven years of preaching in the Boston area and developing a reputation as an effective speaker, he taught in a bible institute for a year and then was chosen president of Genesee College in Lima, New York, which later became Syracuse University. In 1857 he was elected president of Wesleyan, but he did not come to Middletown until 1858, as he did not want to leave Genesee precipitously. A Wesleyan first, he wore a cap and gown to the 1858 Commencement, which prompted one observer to remark that this "added much to the dignity and impressiveness of the scene." Despite the Civil War that raged during his tenure and the subsequent disruption on campus-133 Wesleyan students left to serve in the Union Army, and several others served in the Confederate Army, one as a general-Cummings effected many changes. Cummings supervised the construction of several buildings and the development of College Row, with the inclusion of Rich Library, Memorial Chapel, and the Orange Judd Hall of Natural Science; the enlargement of the curriculum, especially in the natural sciences and by extending the elective system; and the admission of women, a policy that continued until 1909. However, the financial pressures caused by the depression in 1873 created larger deficits that mitigated the expansion Cummings sought. Tension between the trustees and Cummings eventually led to his resignation in 1875. He remained on campus as head of the department of philosophy and left to rejoin the pastorate in 1877. In 1881, he was elected president of Northwestern University, a post he held until his death on May 7, 1890.